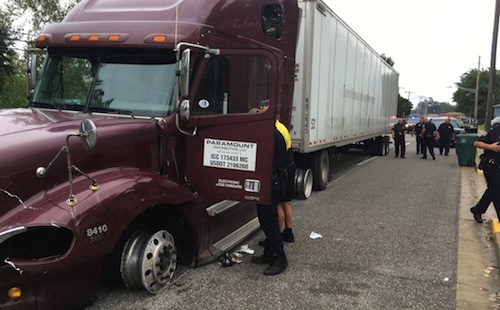 ‘Tis the season for big-rig police chases and this latest incident was the most dramatic yet. Lasting nearly an hour and spanning across state lines, the renegade suspect caused major damage to multiple vehicles, including patrol cars and was finally taken down by shots to his tires, and then subdued by a Taser gun. 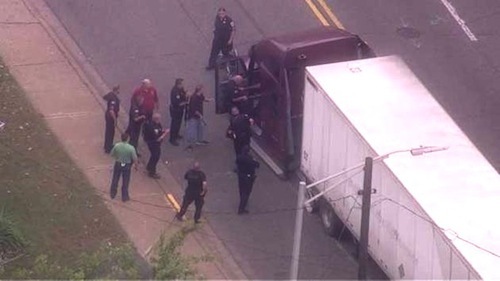 The wild chase began at 10:44 am in Whiting, Indiana when police spotted a semi-truck driving off a truck route around Front and 199th streets. When officers tried to stop the truck, the driver instead sped off and the routine stop escalated into a 51-minute police chase through Whiting, Hammond, East Chicago, Lansing and Calumet City. According to Whiting Police Chief, Stephen Miller, the suspect also struck two squad cars, several parked cars and caused two separate crashes in his wake. “They tried stopping him again, and he just continued on, running stop sign after stop sign,” said Miller. Police say it’s a miracle that nobody was killed or seriously injured by the 44-year old Florida man who apparently had no regard for endangering others during his bizarre attempt to escape the law. In fact, according to Lt. Richard Hoyda, it took three police officers firing shots at the truck’s tires before they finally forced the massive vehicle to stop. But even then, police say the suspect continued to resist arrest when they approached him in the cab and an officer had to use a Taser in order to subdue him before taking him into custody. Residents along the 3800 block of Orchard Drive witnessed the dramatic end of the chase and said they were first startled by the sound of gun shots and the rumble of the tractor-trailer driving by on rims and blown-out tires. Susan Barnes told reporters she first heard all the sirens and thought there might be a parade and then possibly a funeral. Then she looked outside to see the severely damaged truck moving slowly down her street and then she heard several gunshots. When the rig came to its final rest, there were 25 to 30 officers on the scene, and an entire audience of residents aligning the street. Taser lines hung from the open driver’s side door and a single shoe was left behind on the ground as police took the suspect into an SUV. Barnes said they did a good job in a very dangerous situation. The suspect was taken to a local hospital for treatment and then to jail where he faces several felony charges including reckless driving. Police haven’t yet confirmed the driver’s identity or indicated why he took off during the initial traffic stop. He's from Florida. What would you expect. Wait a minute i'm from Florida. I heard this earlier. I'm curious what actually happened and why he ran. Oh yeah! I saw that video yesterday just came into my FB! Only show police officers were trying to get the driver out of truck! That was just short video. Does this mean we get to riot and loot chrome shops. Just joking. Yet another incident of police brutality against truckers. Just kidding...blast that sucker with another 50,000 volts. Give arrow a week and that truck will be available to buy. We should riot! I'm looting the chrome shop first! Depends on who licence I use....today. Me ?? "My name... José Jiménez". Millennials won't get it. Love that movie. "No bucks, no Buck Rogers". Dam they used only tasers!? Stupidity still rages on ! Wayne Jirsa, first thank you for your service. That being said , shoot the dumbass? Don't even know what caused him to snap. I'm a truck driver, when I snap I'm going to dance naked in front a scale house, please don't just shoot me.